“Web Design is 95% Typography,” Oliver Reichenstein once said, and I think there isn’t any designer who won’t agree with these words. Maybe that’s why we all love Typography and everything about it so much. Perhaps WhatTheFont isn’t the best font app for the iPhone out there, but I really love it, so I can’t help mentioning it in the beginning of my list. 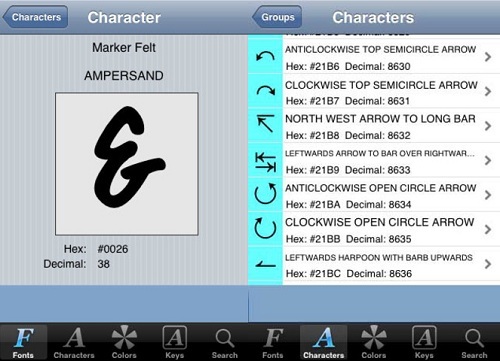 The app can help you find the right font for your project by identifying those in any pic or web page. So if you’ve seen a nice font on a poster or in a magazine or anywhere else, you can just take a photo of it, and the app will identify it or find the closest match. 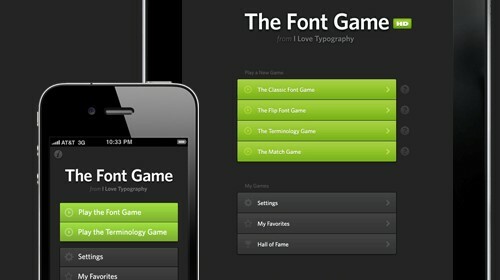 Typography is the next app that has stolen my heart from the first sight. 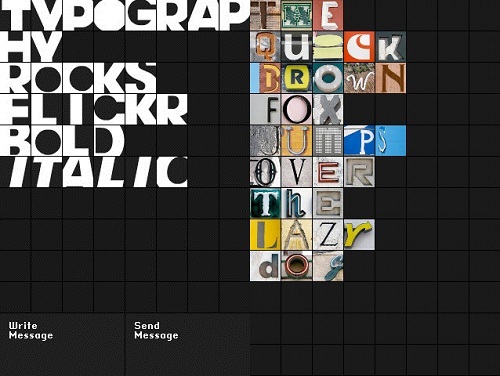 Type in a message, any message, and the app will display it using a set of letters from pics posted on Flickr. You can now send this collage message to one of your friends or use it in one of your projects. By the way, don’t worry for the copyrights of the Flickr images – you can see all the photo credits if you roll over the image. 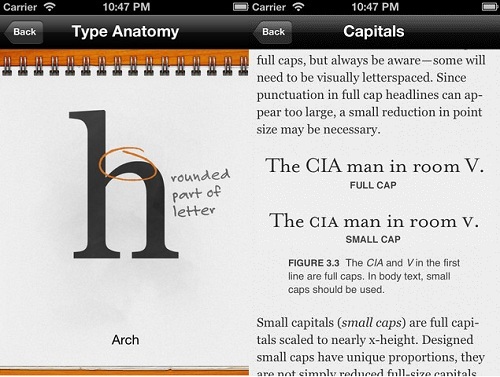 The Typography Manual is a nice resource for graphic designers who work with fonts. It includes a glossary and a book about the history of fonts, graphic design, using typography on the web and much more. Of course, if you’re a designer, you probably already know all those things, but still, in case you need some info on the go, this app is a really useful resource, and you can access all of the info right from your iPhone. 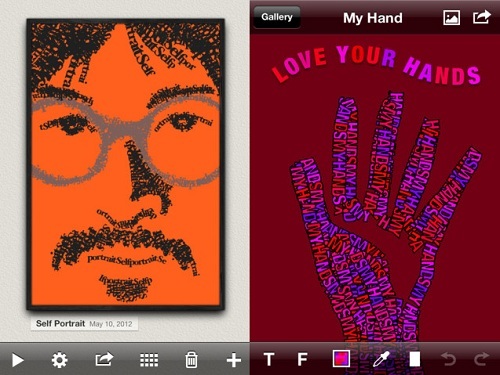 TypeDrawing is one of the best typographic drawing apps I’ve ever seen. You just have to type a sentence and then draw something with your finger, and you’ll get a unique image with your sentences instead of brush strokes. Of course, this isn’t a professional designer program, but you can still create something useful with it. FontBrowser is a very useful Unicode font, color and keyboard keystroke browser that can be used if you need to find the key code for an arrow, the web code for any color or find out what fonts are installed on your iPhone. It includes more than 19,000 Unicode font characters, more than 9,000 colors and a huge number of keyboard codes. If you love fonts, you’ll probably love to play with them literally, too. I’ve found a couple of really nice iPhone and iPad games for font addicts – they can help you get some rest after a long working day or just to while away some hours if you have to wait for something. 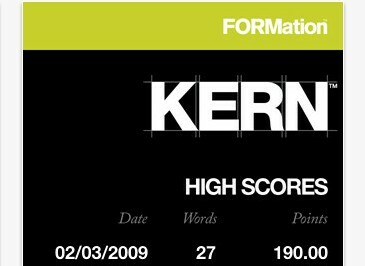 If you think you can recognize any app, be it just Verdana or Myriad Pro, this game created by several typography addicts will help test your knowledge. 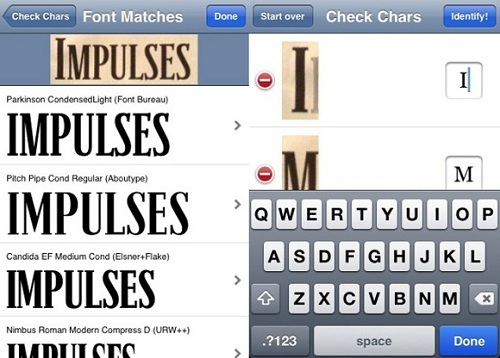 You’ll have to identify the fonts shown by the app, try to guess which term means what in The Terminology Game and have a lot of typographic fan. The game has three difficulty levels; you can also review your answers and learn about the correct ones (if you’ve made any mistakes). And it’s also possible to share your scores via Twitter right from the app. KERN is a rather challenging yet addictive game where you’ll have to put the missing letter into falling words while trying to avoid all of those unnecessary ligatures. Does it sound simple enough? Try it and see! Amelia Hunter from Rightmobilephone.co.uk is a journalist and amateur designer. She likes testing and using different iPhone apps for designers, and her latest passion are fonts and font apps.